EdUCate!’s main purpose is getting resources to the right people (students, teachers, schools) at the right time. To quote the president of Yale University: “If you think education is expensive, try ignorance.” Whether it’s for classroom textbooks or band uniforms, a specific department or classroom project, to say thanks to a special education professional, or to contribute in memory of a special person, EdUCate! offers many ways for you to make the difference in a child’s education. Your contributions are cumulative for each school year, so feel free to donate to all of the various programs we offer and we will make sure you are recognized for your total level of support. Contribute a dollar for each school day or each calendar day, whichever is most appropriate for your budget. Our Goal: Maintaining technology and rigor in our classrooms. Our Dream: We would love for 100% of our schools’ families participating every year. Sponsor a Teacher to attend the 25th Silver Anniversary Taste of the Triangle. Your teacher sponsorship counts towards your Supporter Level and goes a long way to help raise funds for the event! Sponsor the 25th Silver Anniversary Taste of the Triangle, featuring tastes of cuisines from local restaurants and chefs and a silent auction with online preview and bidding prior to the day of the event. A VIP Reception will be held before the event. Event sponsors may attend the VIP Reception and receive benefits based on their sponsorship level. This is a simple and very popular way to send thanks to a teacher, administrator, counselor, or anyone at school who has made a difference in your child’s experience, and at the same time contribute to funds for our schools. Click the Honor A Teacher link above to learn more about this special program. Use my donation where it is most needed! These funds are split three ways to meet the needs of our schools. Typically, one third goes to multi-school projects, one third to teachers in the form of grants and one third to principals to be used as needed. EdUCate! has several memorial funds which have been designated for college scholarships. Click on the Memorial Funds icon here to learn more. Many employers (Becton Dickinson, Qualcomm, and Wells Fargo to name three) will match charitable contributions by their employees to nonprofit (501c3) organizations. Check with your personnel department and contact treasurer@uc-educate.org. We are always looking for businesses committed to education in the community to partner with us in supporting our schools whether by direct donations, in-kind contributions of goods or services, or underwriting a particular program. If you have a business, or a business connection, and would like to help, please contact our President. Donation of appreciated stock or securities is a wonderful way to make a gift to EdUCate! It is a win-win for you and EdUCate! If you would like more information about donating appreciated stock, please contact our President. EdUCate! maintains an Endowment Fund which provides our schools with income each year. All contributions to the Endowment Fund go directly into the Fund. The principal of the Fund is permanently invested and the income generated by those investments is either reinvested or transferred into the General Fund each year. Your gift will never be spent, but the income it generates will be, forever. 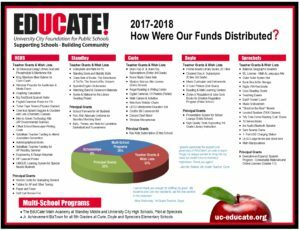 Please consider making a contribution to the “Endowment Fund of the University City Foundation for Public Schools” as well as making the Endowment one of the beneficiaries in your Will or Trust. You can designate your United Way/CHAD contribution to U.C. Foundation for Public Schools – pledge code 99684. EdUCate! is an Amazon affiliate which allows a small percentage of your Amazon purchases to benefit our schools. All you need to do is shop through our unique link. The price you pay does not change! The amount we earn varies but it is at least 4% of the sale and sometimes as much as 10%. Sign up online at www.escrip.com and register your eligible cards to activate contributions by participating retailers. Our group ID is 151237892 and the name to designate is “EdUCate!”.